Here at Royal Mums we love coming across products which are not only fun for our little ones but also educational. The Okido magazine is full of beautiful illustrations to engage your children. Okido are the experts of ‘hidden learning’ and that we truly love. Please read the full feature to find out more about Okido the Art & Science Magazine for Kids. RM: Tell us about the people behind Okido? OM: Two mums – one a scientist; Sophie Dauvois and the other, an artist; Rachel Ortas. RM: How was Okido born? 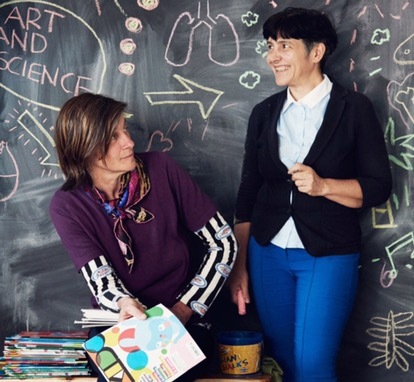 OM: Rachel and Sophie both believe that science and art should be taught together to young children and that both are as important as each other. STEAM – Science, Technology, English, ART and Maths – not STEM! Sophie, the Editor, wanted to produce a high quality publication for children with no advertising and using the best illustrators available. She was also very driven to provide an educational product that would teach children in the most playful and informal way and was determined to provide a non-gender defined children’s product – something that would appeal to both boys and girls and that would talk to them all in the same way. RM: Tell us about Okido? OM: OKIDO Magazine is now the leading science and arts publication for young children and their families. Published every two months OKIDO costs £4 or is available as a subscription for £19.99. OKIDO is printed on FSC paper using biodegradable vegetable inks and contains no adverts whatsoever. (You can even safely eat it!) Full of stories, songs, poems, experiments, doodles, recipes, characters, games, puzzles and more OKIDO is printed in full colour and is aimed at curious children aged 3-8 years old. The lead character in OKIDO is called Messy Monster and we have now created an animated, science, TV show for the BBC called Messy goes to Okido. This airs on CBeebies each week day. We now also produce a range of hard-back fact books, have a new range of TV tie-in books with Thames and Hudson and we are about to launch our first Messy Monster soft toy this autumn. RM: What will readers gain from a subscription to Okido? OM: An exciting delivery every two months direct through their letterbox for starters! We also let our subscribers know about all of our public events and workshops, news of offers and new products before anyone else. Sometimes we’re able to offer them treats and surprises from our friends too. RM: What’s your favourite part of Okido magazine? OM: The diverse range of illustrations and illustrators that are involved in every issue…OKIDO really is like a treasure box of delightful children’s design that you won’t find anywhere else. We’ve also become experts at offering ‘hidden learning’ for children and we all get great reward from seeing children learn so much about the world around them while having such fun. RM: Where can we find Okido Magazine? OM: You can buy OKIDO from many high quality independent retailers throughout the UK and selected WHSmiths stores. You can buy current and back issues direct from our web shop at http://okido.imbmsubs.com/okido-shop/. To find more about Okido Magazine and want to keep up to date with their recent activities then please visit Okido Magazine’s social media pages.